Storm Surge, Most Hideous Model ever? OK, everyone, is it me, or does anyone else thing that the Storm Surge is the most hideous model ever? Exposed Pilots... EXPOSED PILOTS?!? Really GW? Really? No Arms. How the hell does this thing stand back up is it's knocked over? I don't know about anyone else, but I'm using a Riptide base and then adding the weapons from the Storm Surge to it. I'll use 6 SMS pods to represent the multi-rocket pods, the secondary weapons I'll add to the arms, and the 4 seeker missile looking things I'll add to the lower legs. From the Makers of Lemon Flavored Kitten souls, comes the newest in Taste Sensations... Mutant Evil Sauce(tm)*! Mutant Evil Sauce is Good(tm) on EVERYTHING. Re: Storm Surge, Most Hideous Model ever? Without knowing any of the models fluff, its hard to really judge the design beyond comparing to previous models and previously defined fluff. However that would have made the shoulders and back increadibly cluster, and so perhaps and underarm design would have been better. The stabilizers don't look good either, for the reasons you've said. for such a top heavy mech, the most logical choice, in my mind, would have been a tripod platform. Though this may not work so well with Tau aesthetic, it would have made more sense as a tripod is leagues more stable than a biped. Considering the amount of plastic, I can't help but feel there is a lot of blank slabs of "Metal" that are likely meant for the hobbyist to fill with whatever their imagination dictates, or for Sept specific iconography. As a it, it would be very expensive conversion fodder, and I'd likely not build it for the intended purpose. I'd likely cannabalize the weapons onto a Riptide, as they do look impressive. Here they're just poorly placed and feel slapped together onto a hulking mess of a mech body. I'd likely cannabalize the weapons onto a Riptide, as they do look impressive. Here they're just poorly placed and feel slapped together onto a hulking mess of a mech body. Exactly. 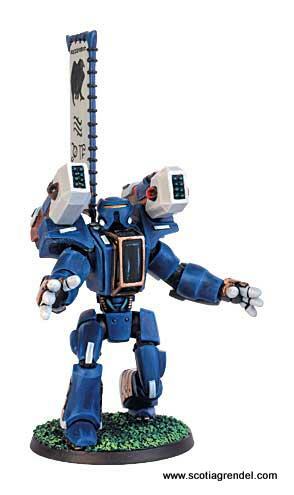 With a Riptide you can place the big gun under an arm and set the feet as if the Riptide is bracing for salvo fire. The Storm Surge is just too ungainly for a "real" mech. Anyone else think it looks like he's popping a squat? Thats more an unfortunate sideeffect of the posing. Any gunman who has to keep modile, but needs to postion themselves to keep steady to fire weapons would crouch down and brace. IT perhaps one of the few things this model does right, but aspects surounding that fact (like the high heels supports) ruin the overall appearence. I'd not previously heard of this model, but I'm very out of touch with new releases these days. For anyone else who has not seen it, take a look at the picture on GW's website. I'm not impressed. It lacks the sleek design that I associate with Tau, and looks overly bulky and clumsy. That said, it's definitely not the worst model that GW has ever produced. There are plenty of other candidates for that. It's probably the worst model that GW has ever produced for the Tau though.